Thunder Point Cottage is a family's dream lodging vacation place. Offering an adorable cottage near the water with a loft apartment steps away from this well appointed main cabin/cottage! The apartment features an Artist's Loft that sleeps 6 and has a sauna. Conveniently located on a quiet road on a small lake that is connected via a small channel/culvert to the larger Windigo Lake. This ideal family compound is close to 4 great restaurants and other fun "Up North" activities. This family friendly cottage also includes the use of 2 kayaks and a paddle boat! Stacy has been managing numerous beautiful lake properties in the Spooner/Hayward area since 2011. 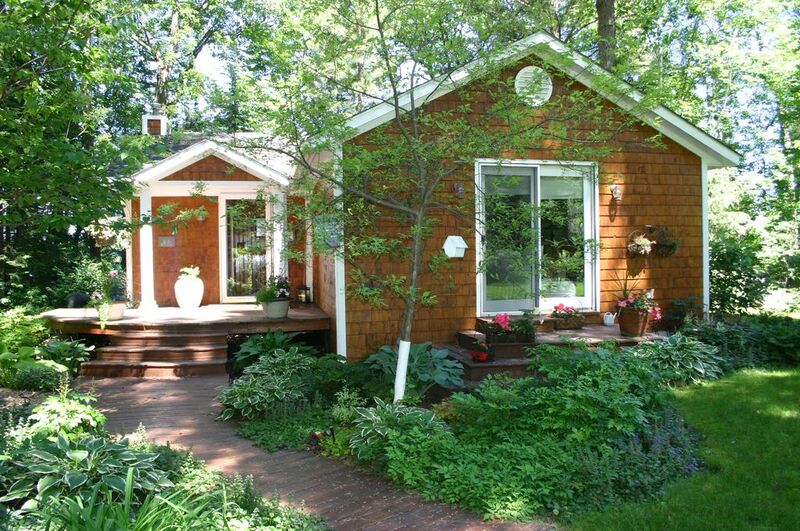 She met the owner of this quaint cottage several years ago and has really been enjoying helping her share this beautiful, serene Northwoods Getaway! This property has been in the owner's family for years and although she comes up less often than she would like, she still wants to retain her little peace of "Up North " heaven...She is happy to share her retreat with others and to let them create great family memories as well. It was originally Grampa's cabin and over the years the family grew and they remodeled it, added the garage and Artist's Loft for doing crafts and for family overflow. You will fall in love with the privacy, the well appointed Cottage, Artist's Loft and fun water front area with a family fire ring, 2 kayaks and a paddle boat! It is also only a few miles to great restaurants and fun activities. toilet, shower, The Artist's loft bathroom also has a sauna! There is a view of the lake from nearly every window, in both the Cottage and the Loft! Beautifully private lakeshore- there are no other cabins across the lake, just natural beauty to look at! X-C ski right out the door of the cottage onto the lake for un-groomed trails! Bathroom towels are provided. But you will need to bring your own beach towels. With two living room areas in which to relax; this makes this a great rental for extended family and friends! Beautiful professional kitchen for making great meals! The Artist area in the Loft with seating for 4 or more has lots of room for art and crafts! In the winter, cross-country ski or snowshoe out from the lake shore and around the island! A spacious sauna is located in the bathroom area in the Artist's Loft... ah! Kayak into the neighboring larger lake via a deep stream for even more adventures! This property is conveniently located only a few short miles from many favorite restaurants and activities! Thunder point cottage was great! Beautiful location right on the water! Stacy was great to work with! The only downfall to the accommodations was the furnace in the loft acted up one night of our stay. Stacy had someone there right away and they remedied the problem right away! So I still gave a 5 star rating as the furnace acting up was unforeseeable and Stacy was great handling the problem! Beautiful accommodations and a great setting! I highly recommend staying at Thunder Point Cottage!! Thank you so much for your kind words, Michael. I'm so happy we were able to take care of the problem quickly. :-) We are pleased you enjoyed your visit to Thunder Point Cottage and hope to see you again! Clean, restful, private and perfect for our family! Our stay at the cottage was perfect. Everything was very clean and organized. The kitchen was well-equipped for cooking. We were wanting for nothing. And the atmosphere and decor were lovely and relaxing. Stacy did a phenomenal job of checking in via text and helping us during our stay. We would stay again in a heartbeat! Daniel, I am happy I was able to help make your visit enjoyable. :-) We are pleased you found the cottage clean, well-equipped and restful. Please stay with us again and, perhaps, visit during one of our other beautiful seasons! Clean and comfy. Everything we needed, and more! Waking up and walking into a full panoramic of woodsy bliss was so filling. Thank you. Your home is a gift. What a lovely description of your time at Thunder Point Cottage, Adrianne. Thank you so much! We loved the separate artist loft. A perfect way to spend a long weekend with family! It had everything we needed and we had just the right amount (not too much, not too little) of "check-in" to make sure we were enjoying our stay. Tommy, thank you for your kind words. :-) It pleases us that you and your family enjoyed your long weekend at Thunder Point Cottage. The Artist's Loft is special and we're happy you were able to experience it. Perfect retreat for a fall family getaway. Very clean, and the open layout was perfect for cooking and hanging out in front of a warm fire. The decor was charming inside and out. We were wishing for nicer weather to enjoy the outdoor fire pit and kayaks. Will have to come back! The town of Hayward is only 15 miles away, with more restaurants, great shopping, and many attractions. These include: the Freshwater Fishing Hall of Fame, the Wilderness Walk (including a petting zoo), Lumberjack Shows, the Park Center (live music concerts and events), mini-golf, etc!